Abstract: Even though scholars' attention has been placed on Social Innovation (SI), little evidence has been provided with regards to which tools are actually used to address social needs and foster Social Innovation initiatives. The purpose of the article is twofold. Firstly, the article offers empirical recognition to SI by investigating, on a large-scale, social and innovative activities conducted by start-ups and small and medium-sized enterprises (SMEs) across the world between 2001 and 2014. Secondly, the article intends to capture SI core businesses and underlying complementarities between products, markets, and technologies and show in which way digital media and IT are essentially tracing innovation trajectories over a multitude of industries, leading the current industrial patterns of SI, and continually fostering its cross-industry nature. Social Innovation (SI) has acknowledged in the last decades a rapid growing both for scholars and policy makers (Adams and Hess, 2010). According to Mulgan (2006), Social Innovation (SI) refers to innovative activities that are motivated by a social need. Innovation is "social" to the extent that it may not necessarily be "good", but it is socially desirable (Howaldt and Schwarz, 2010) and satisfies a social need not perceived as relevant by the market (Mulgan et al., 2007). Auerswald (2009: 52) defines SI as "a novel solution to a social problem that is more effective, efficient, sustainable, or just than existing solutions andfor which the value created accrues primarily to society as a whole rather than private individual." In other words, SI is related to all social and societal demands or challenges where any sort of innovation can procure an improvement based on newness and progress (Mulgan, 2006; Dawsond & Daniel, 2010). Hamalainen and Heiskala (2007) define SI as a way to address needs or resolve problems identifying new ideas or new social structures. This description induces a shift towards a demand-pull model where solutions are adopted by a large number of individuals who participate in its development (Eikins et al., 1992; Guida and Maio-lini, 2013), with an explicit focus on social interactions (Marcy and Mumford, 2007; Maruyama et al., 2007). An extensive debate is emerging in the literature about the meaning of Social Innovation (SI), while empirical studies are relatively few (Caulier-Grice et al., 2012; Bulut et al., 2013; Howaldt and Schwarz, 2010). Nowadays, a large percentage of innovative solutions come from information technology (IT) applications and tools. Bulut et al. (2013) investigate the emergence of SI from a social perspective and examine the causal relationships between SI and technological innovation. Moreover, they shed light on the "relativity" of SI, and the fact that it is oblique to different geographical and socio-economic activities (which suggests it is important to understand how SI initiatives develop and grow based on cross-industry flows of opportunities and cross-scale processes). The purpose of the article is twofold. Firstly, the article offers empirical recognition to SI by investigating, on a large-scale, social and innovative activities conducted by start-ups and small and medium-sized enterprises (SMEs) across the world between 2001 and 2014. Secondly, we empirically explored the phenomenon using metadata to build a network analysis to capture SI core businesses' categories and identify complementarities between products, markets, and technologies in order to show how digital media are actually tracing innovation trajectories over a multitude of markets. The analysis provides info about the current industrial patterns of Social Innovation, fostering the SI cross-industry nature. This evidence is remarkable since literature investigating the key role that digital tools and IT play in changing the way individuals interact, providing few indications with regards to which digital tools are actually used to address social needs. The article is organized as follows. The literature review section focuses on the role of digital tools (and more in general IT tools) as enablers of SI, facilitating the emergence and dissemination of social and innovative ideas. The third section describes the dataset (data selection criteria), identifying the main economic figures, and trends related to the population of SI companies. In the methodology section we propose a network analysis to highlight emerging core businesses, market and technological complementarities, identifying mobile, social networks and platforms, social media, and the web as relevant SI drivers. The metrics of the resulting networks, at both node and network level, are discussed from an economic point of view. The paper concludes with suggestions and some directions for future research. Since the interplay among individuals is multifaceted, especially in case of a large number of players (West and Lakhani, 2008), digital tools and IT play a key role in changing the way individuals interact (Hinds and Kiesler 2002): such technologies helps in making information explicit and allows participants to keep in touch and resolve social and societal issues more quickly and effectively. Katz and Rice (2002) emphasize the ability of IT to sustain the collective dimension in decision-making and knowledge flows, while Pisano and Verganti (2008) illustrate how digitalization and IT reduce the cost of accessing innovative ideas. According to Fink (2007), a well-designed IT architecture is crucial in increasing the level of knowledge dissemination and developing new processes and products, especially as a way to foster knowledge generation (de Souza and Júnior, 2013). Thanks to the emergence of an extremely large set of digitalized Tools, it is possible for many individuals to actively participate in the generation and implementation of new ideas (Hutter et al. 2011). So far little evidence has been provided with regards to which digital tools are actually used to address social needs (Smith and McKeen, 2011). To sum up, digital tools ensure the tools by which SI players interact and the present article aims at identifying current digital devices, channels and platforms enabling new SI initiatives. This particular branch of literature is strictly connected to the digitalization of social issues, particularly linked to how social connectivity matters (Shih, 2009). As argued by Vaccaro and Madsen (2009) Internet-based technologies can assist firms to increase relationships between individuals and business practices, in relation to ethical issues and social challenges. With our research we would like to focus on hi-tech organizations (start-ups and SMEs) tracing social innovation trajectories over a multitude of markets. Data were collected from the web and CrunchBase. This latter is the world's most comprehensive database on innovative companies, freely accessible via an application-programming interface (API). It began in 2007 and included information on the profiles of more than 200,000 innovative companies, and is maintained by on-line contributors. The companies listed are active in several innovative industries including biotech, clean-tech, e-commerce, education, finance, health, hospitality, medical, nanotech, and software. For most of the companies the database includes information on a number of employees, category codes, total money raised, number and timing of financing rounds, tags and keywords related to markets, products, and technologies, city of registration, operating offices, and so on. Data from CrunchBase are used increasingly in research (Block and Sand-ner, 2011; Marra et al., 2015). The choice to employ information from CrunchBase is based on the acknowledgment that current SI initiatives rely heavily on innovation and new technologies, and on the need for a large and homogeneous set of data that allow detailed examination with no limitation to industrial classification codes. In the present work, 30,824 companies represent the SI population, a subset of all innovative companies listed in CrunchBase (the Crunch population). The identification of the Si population was a long exercise. First, we collected the metadata for each company included in the database, ordered them, and deleted duplicates. Second, from the over 140,000 unique tags in CrunchBase, we manually selected around 7,000 tags (5% out of the total), also in light of potential tags' combinations, according to the operating schema of social and innovative activities provided by the European Commission (2013). The authors of the present study performed this step independently. The results were compared (more than 97.2% of the identified tags were selected independently by all the authors), checked and approved by two SI industry experts, and combined into a dataset. The resulting SI population includes some well-known innovative companies and many not recognized social and innovative companies including: a start-up promoting creativity and entrepreneurship to build livable and sustainable cities; an e-democracy platform that utilizes crowd-sourcing for collaboration to determine the most effective solutions, and organize action to oversee change through to implementation; a non-profit organization which is at the forefront of a new movement based on the belief that children and families deserve the help of technology tools; a start-up that provides a well-designed, easy to digest blog in the M2M environment; a platform and active media for creating SI through crowd-funding, petitions, and open democracy; a new company developing a SI platform that enables organizations to solve business problems by crowd-sourcing from the pool of global talent. Social and innovative activities are a fragmented phenomenon in the United States: according to the Great Social Enterprise Census (2013) by Pacific Community Ventures only 20% of social enterprises are larger than the US $ 2 million in budget, just 8% employ more than a 100 people, and 60% were founded since 2006. Our investigation allows drawing useful insights into some figures and trends related to SI start-ups and SMEs. Firstly, the tendency in the number of firms by year of foundation is increasing, and surpassed the 4,000 units' level in the period 20102012. Observing at both SI and Crunch companies per year of foundation we notice that their ratio increases between 2001 and 2013 from 29.5% to 44.2%, with a peak (47%) in 2012. Moreover, comparing the total number of employees for the entire period, is evident that the SI subset 621,440 is different from the Crunch dataset 1,357,727 (45.7%). Additionally, the total volume of money raised by the SI population is the US is $ 82,6 billion v.s. the total raised by the Crunch Companies US $ 241.8 billion that is 34.2% of the total amount in the Crunch dataset refers to SI start-ups. Information on the amount of funding per year of investment is available for many companies, but lack of detailed data on amounts and year for every single investments' round does not allow to propose a total amount per year of investment that is consistent with the above figures. The total quantity of money raised by observed companies per year of funding is US $ 60.8 billion for the SI subset and US $ 179.8 billion for the Crunch dataset. Observing the trends for both SI and Crunch funding per year of investment since 2007 we notice a ratio of 36% on average, with relevant spikes in 2008 (51%), 2009 (38%), and 2011 (43%). These data on funding are reliable compared with other estimations, at least since 2006 when SI activities gained real momentum: The Center for Venture Research (2011) at the University of New Hampshire reports that angel investments augmented from US $ 17 billion to US $ 20 billion between 2009 and 2010. Looking at the cities with the majority of SI start-ups that operates in a specific urban area, Chicago displays the greater percentage with 47.5% of SI start-ups, followed by Berlin (45.3%), San Francisco (42.4%), New York (39.6%), London (39.3%), Austin (37%), Los Angeles (36.6%), Paris (36.2%), Palo Alto (35.8%), and Mountain View (33.5%). As known, SI companies favour urban areas where new ideas spread more quickly and find matching users' needs, where markets can grow rapidly, entrepreneurial activities with non-profit origins can evolve and transform the underlying business model (Mulgan, 2006; Bulut et. al, 2013). Cities mentioned above have a strong presence in some innovative industries, such as mobile, software, web development, advertising, and enterprise services. The technology industrial structure in Chicago is diversified (seven industries present percentage values above 5%) with high values for advertising (19%), software (15%), web (10%), enterprise services (10%), e-commerce (9%), analytics (5%) and mobile (5%). The concentration in software and web is well below the levels in New York and San Francisco. New York has a diversified economy, similar to Chicago, with the Web (17%), software (16%), advertising (13%), mobile (7%), e-commerce (6%), and enterprise services (5%) as the most relevant sectors. San Francisco has a more specialized urban economy: values above 5% are found for social (6%), software (42%), and the Web (27%). As well known, SI has strong implications for education (college and schools), access to news and information (blogs, university, research), poverty, health, climate change (green, energy), unemployment (recruiting, workplace), discrimination, welfare, social networking (collaboration, community, learning, sharing), crowdsourcing, training, small business, security, charity, urban regeneration, social economy. Looking at these areas and activities, it is clear that an investigation of SI could not be circumscribed to the assessment of too general category codes: this fact suggested to concentrate our efforts on metadata, tags and keywords related to companies' markets, products, and technologies. The SI subset is sorted by ranking of tags, counting the times that a specific tag appears in the SI dataset; at the top of the ranking are located: mobile (2,261), social-media (2,082), social-network (2,006), big data (570), analytics (503), music (490), video (575), and marketing (1,049). This first range of tags confirms the universal scope of SI across different businesses. Also, in the top 100 tags there are businesses that are close to the common understanding of SI, like education (1,031), healthcare (826), community (719), food (349), news and entertainment (respectively 339 and 336), sharing (306), sports & Training (269 and 255), crowd-funding (235), art (232), college (222) and learning (200), etc. We used as a methodology network analysis that it is strongly recognized and used into economic and managerial disciplines such a long time (Jackson, 2011). As seen, SI is "oblique" to several markets, products and technologies (Auerswald, 2009) and this induced looking for an alternative way to visualize the extent of the SI phenomenon. The proposed network analysis using metadata allows capturing SI markets, products and technologies, and underlying complementarities between them. A network node symbolizes the co-occurrence of a tag within two companies: for example, tags A and B are linked in the network if these coexist in the same company. A second measure is provided with the weight of the nodes: it is heavier if the number of companies in which the two tags coexist is greater. Consequently, for tags A and B, the weight of the edge A-B is five since these tags concur in five diverse firms, and the weight of the edge A-C is two because these tags coexist in two different firms, and so on (Table 1). More weighted edges represent actual links between markets, products, and technologies through which social and innovative companies drive their research, production and marketing efforts. The analysis is established using a network of Social Innovation tags (where the links between tagi and tagj is calculated from the co-existence of tagi and tagj in the same firm), which is based on a two-mode matrix Xt, where the rows are tags and the columns are firms. The square matrix representing the number of links a״ among tagi and tag. is the adjacency matrix At, which again is calculated as the product of Xt and X't. according to Bastian et al. 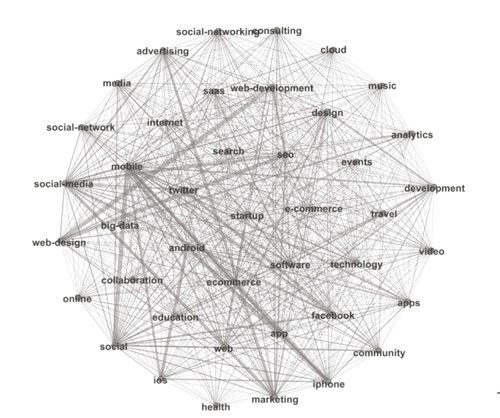 (2009), the open-soruce software Gephi has been used to visualize data as a picture of network analysis. The network linking SI initiatives includes 58,478 nodes (tags) and 640,833 edges (connections between tags based on their co-occurrence in the same company). 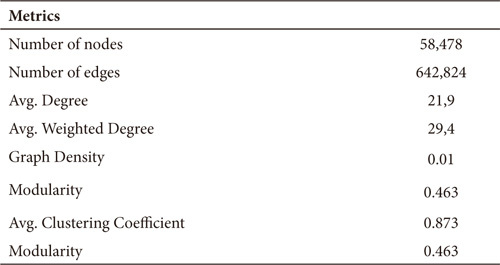 Several descriptive statistics are defined below along with their economic interpretation (Table 2). The density D of the network is defined as the ratio of the number of edges and to the maximum number of edges possible within the network. D varies between 0 and 1; the closer to 1, the denser the network, otherwise it is sparse. The observed SI network is very low density, which means that the graph is large and diversified and, hence, is informative about the variety of SI activities and initiatives involved. Closely related to network density are the average degree, where degree k of a node is the number of edges connected to it, and weighted average degree which is the summation of the weights of the total of links attached to node i.
Centrality indices produce rankings to identify the most central nodes in the network. Intuitively, a node is central if it has the highest number of edges with other nodes. This concept of centrality is limited to direct links (links directly connected to that node). Centrality can also be related to indirect links (links not directly connected to the specific node). For instance, in a network with a star structure in which all nodes have ties to one central node, the centrality of the central node is equal to 1 (normalized value). According to degree, the most important nodes are mobile (5,166), social-media (4,734), social (4,256), e-commerce (4,246), software (3,533), social-network (3,232), saas (software as a service; 3,210), marketing (3,055), iPhone (2,790), and education (2,730). Whereas the former concept of cen-trality is meant in terms of the number of nodes to which a node is linked, the latter concept is in terms of the distances among the various nodes: two nodes are associated by a path if there is a chain of distinct links interconnecting them, and the length of the path is the number of edges that comprise it. Betweenness centrality measures the extent to which a particular node lies "between" other nodes in the network, and establishes the relative connotation of a node by measuring the fraction of the paths connecting all pairs of nodes, and holding the node of interest: a node with only a few edges might play as a bridge and so be very central to the graph. Central nodes are IT devices, channels and platforms such as mobile, social media, media, social network, e-commerce, marketing, community, and education. Modularity is a measure of the network. Networks with high modularity show dense connections between nodes within modules, but sparse connections between nodes in different modules. The value (0.2) is low and indicates the absence of very strong aggregates within the network, which emphasizes the fertilization nature of SI. The reduction of the network helps in identifying some relevant aggregates of nodes. In Figure 1 the network has been limited by degree (the minimum degree has been set at 1,500, with the maximum value at 5,167) to get a preliminary view of the diffusion of SI through markets, products, and technologies. The resulting network has 42 nodes and 853 edges (respectively, 0,07% of total nodes and 0,13% of total edges), and parameters are: average degree 40.6, average weighted degree 1,425, graph density 0.991, modularity 0.19, network diameter 2, and average path length 1.009. In such a restricted network, four modularity classes or aggregates emerge: the smallest class represents the 4,76% of the network and links basically big data, analytics, and other relevant areas; the second aggregate is given by the 19% of the network and includes all social media activities, web-development and web-design; the third modularity class equals 26,2% of the network and mainly interconnects central nodes such as mobile, software, web, and the two mobile operating systems; the largest aggregate covers the remaining 50% and includes all other nodes and edges across the network. As seen, aside from the weight or centrality of the single node, some insights derive once each node is positioned in relation to every other node. We find the most robust connections between: mobile and social; mobile and social-media; mobile and software, and social-media and social network (Figure 1). Some major patterns and SI trajectories emerge from non-trivial associations between tags. First, social and innovative activities are associated with certain communication channels (mobile, web, internet, media), software development (web-design and development, apps, search engine optimization), operating systems (Android, IOS), specific devices (iPad, iPhone), major social platforms (Facebook and Twitter), technologies and services (cloud, saas, analytics) and industries (advertising, e-commerce, social-network, education). These can be grouped into three sets of drivers: (a) mobile as a device; (b) web and social as channels/platforms; (c) marketing, education, and e-commerce as relevant businesses. It should not be surprise to find out the scope for marketing, advertising and e-commerce in SI: digital tools and IT enable a higher level of personalization and targeting, crucial for the full understanding of individuals' needs, than more traditional approaches (Millard and Carpenter, 2014). Since the increasing diffusion of social marketing sees the common attempt to influence social behaviour, not to the marketer's benefit, but to benefit the target audience and the general society. Moreover, one of the key factors for SI companies is to adopt a marketing approach, which is needed to reach large audience at early stages. To maximize the impact of SI initiatives, entrepreneurs need to look for the highest adoption rate on the market and strong marketing campaigns (e.g., leveraging the online community through social media, blogs, forums and online publications) are crucial. In this respect, also ecommerce can be argued to represent an SI initiative, since it brings change in the way individuals communicate, create wealth, entertain, work, and shop. Digitalization enables and supports SI, increasing the magnitude of social and innovative activities, creating totally new social, business, and governance models and new value chain forms. IT is used to create new content, serves to identify new social needs, and contributes to solve the matching between assets and needs, identify new solutions, address circumscribed social needs. Figure 2 provides a wider view of the SI network (with the setting of a lower minimum degree, 1,000) and distinguishes among three different tiers of significance, defined by relevance, closeness, and relation. The first tier includes all items that are "core" to SI since these represent areas where social and innovative activities are relevant, and are represented by all the tags within the red boundary such as education, social networking, mobile, cloud, big data, social media, collaboration, community, research, blog, crowdsourcing, training, and so on. Together with relevant SI industries and areas, digital tools lead the patterns. The second tier includes all items that are close to SI (i.e. 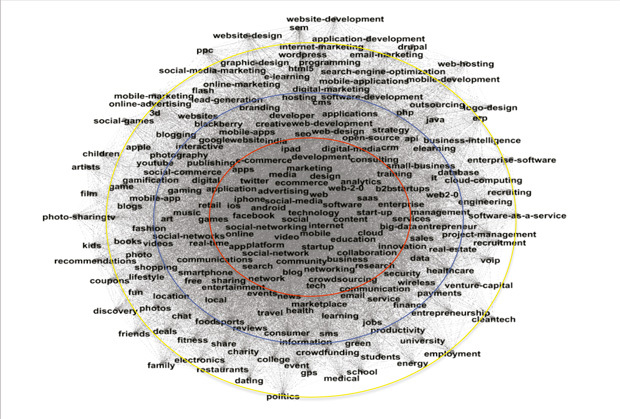 reliant on social and innovative activities) but where the underlying connection is less strong such as music, games, healthcare, finance, travel, interactive, open source, small business, security, learning, information, entertainment and sharing (outside the red perimeter and within the blue circle). Also, in this case, digitalization and IT produce relevant implications as long as it impacts on all above businesses. The third tier in the network (between the blue and yellow boundaries) is an amalgam of activities that have some kind of relationship, which is difficult to classify and systematize, with the SI core businesses, and include, among many others, tags such as outsourcing, clean-tech, green, energy, university, school, college, books, e-learning, recruiting, employment, venture capital, politics, charity, social and digital marketing, and so on. In this last tier, the IT influence is weaker and less direct (aside from e-learning and social and digital marketing). The purpose of the article was twofold. Firstly, the article offered empirical recognition to SI by investigating, on a large-scale, social and innovative activities conducted by start-ups and small and medium-sized enterprises (SMEs) across the world between 2001 and 2014. Then, the article planned to capture SI core businesses and underlying complementarities between products, markets, and technologies, through a network analysis of metadata. The analysis demonstrates in which way digital media are essentially tracking innovation trajectories over a multitude of industries, controlling the current industrial patterns of SI, and constantly advancing the SI cross-industry nature. Some major patterns and SI trajectories emerge from the network analysis. First, social and innovative activities are associated with certain communication channels, software development, operating systems, specific devices, major social platforms, technologies and services and industries. These can be grouped into three sets of drivers: (a) mobile as a device; (b) Web and social as channels/platforms; (c) marketing, education, and e-commerce as relevant businesses. The study contributes to debate on SI, offering an original view of the phenomenon and identifying economic figures, trends and industry patterns. A focus on start-ups and innovative SMEs is useful because SI is often disruptive and increasingly the domain of new and young companies, which makes it difficult to paint a complete picture. The article shows that digitalization plays a key role in shaping SI sector boundaries, continually fostering its cross-industry nature, and constantly changing the SI phenomenon, which is not easy to define regarding markets, products, and services. The understating of SI implies an increasing emphasis on the role of communities in creating and disseminating innovation and the way new technologies can support these (West and Lakhani, 2008; Smith and McKeen, 2011). A holistic interpretation of SI underlines the interaction between agents operating in different fields and using specific technologies as innovation enablers (Millard and Carpenter, 2014). In particular, digital media provide new solutions and alternative ways to solve problems: Millard and Carpenter (2014) suggest that IT and new technologies facilitate connectivity and simplicity, enhance user experience, and enable new forms of SI based on different combinations of platforms, devices, networks and communities, and change the rules and roles of actors within communities. The study results provide information for innovation managers, social innovation strategists and all of them (entrepreneurs, local policy makers) interested in understanding the most suitable technologies that can be used within a social innovation project. The identification of the main digital technologies used infra sectors is a strong information that can be used to increase the social contribution of technical products under development. The role of different digital technologies can be used also to understand actual direction of SI development and possible future scenarios. This paper's findings open numerous new opportunities for further research. Next studies can concentrate on deeper understanding how different technologies impact on different industries or look to the phenomenon from a longitudinal perspective and monitor the evolution of the technological trajectories founded in this research. Other comparative contexts, such as CSR, could be included in future research, making, for example, a comparison among different typologies of sustainable innovation. We hope that our research will incite and motivate other academics to undertake research in this area. It could be also very interesting to understand what kind of companies are the primary drivers of such innovation, and explore what practices do they use in order to reply to specific social needs, or the level of success of that specific technologies to reply to social challenges. Adams, D. and Hess, M. (2010). Social innovation and why it has policy significance, The Economic and Labour 21(2), 139-155.